Paul talks a lot in scripture of being a new creation. How we are new in Christ. How the old is done away with, the old is gone, the old man is dead. The new man is raised up with Christ! And that’s awesome. But most days, it doesn’t feel that way for me. Most days it still feels like I battle the same old things. Face the same old struggles. Fight the same old fights. I know that I’m new in Christ. That’s what the Bible tells me. But, a lot of days, I just don’t feel it. Our lives are hidden in Christ. Our lives are with Him. How then, do we know that, live that, see that, experience that? We seek the things that are above. We set our minds on things that are above. We focus on what is good. What is pure. What is holy. Where does it drift today? Today, as we do our best to be the new creation that God has created us to be, we have to set our minds on things that are above. Where ever mind is, where ever our focus is, that’s where we will go. Today, you are a new creation. You are His, and He is yours. Set your mind on Him. Focus on Him. Live in His power and His life. And He will be the one making you a new creation. 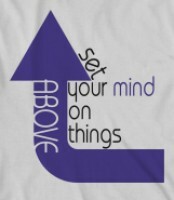 Set your mind on things above. And be obedient to where it is that He is leading you. He will make you new.